BATTLE GROUND — For the second year in a row, the 21st Century Artist Initiative is bringing the works of history’s most beloved classical composers to the public through a week-long concert series in Battle Ground and Portland. 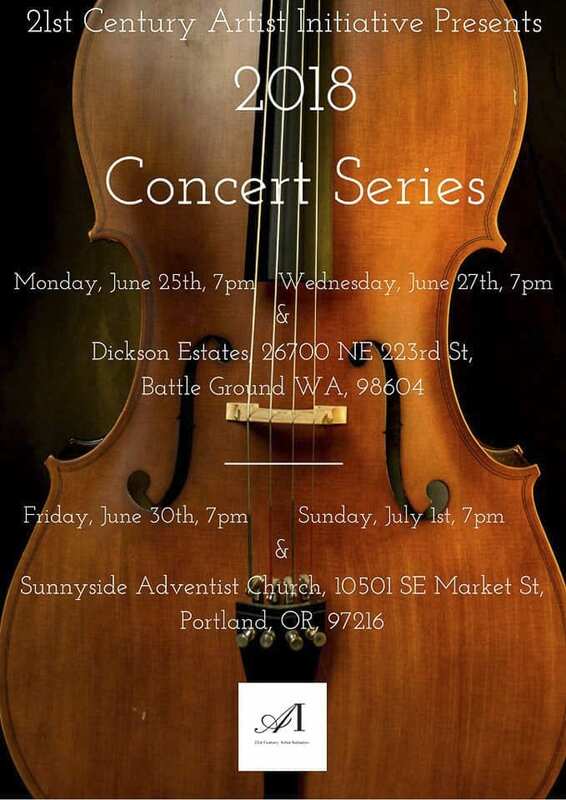 The first concert was held on June 25 in Battle Ground, where musicians from across the United States performed in a piano trio and string quintet some selected works from Antonin Dvorak and Franz Schubert. The 21st Century Artist Initiative’s artistic director, Daniel Dickson, explains that the organization was founded with the goal of assisting musicians to effectively integrate their line of work into the modern business realm. 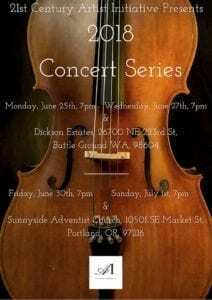 As part of an effort to raise community awareness of the organization’s presence in the Northwest, Dickson has organized a series consisting of four free concerts, with the hopes that these performances will spark an interest in classical music among area families. Musicians featured in the week-long concert series come to the stage from a variety of musical and personal backgrounds. 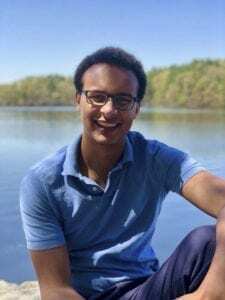 Among them are Jonathan Butler, a Texan graduate of the New England Conservatory, and Vancouver resident and lauded classical and improvisational pianist Colleen Adent. Audience can also expect to hear from violinists and Juilliard graduates Jocelyn Zhu and Laura Ha. Benjamin Dickson, acclaimed violist and brother to Daniel Dickson, will also perform. “There’s a mixture of quintets, trios, quartets, even an octet. We’re really trying to give everybody the really broad range that classical music has,” says Daniel Dickson. The first two concerts in the series will be hosted at Dickson’s family home, the Dickson Estates, in Battle Ground, a venue which many of the performing musicians enjoy due to its intimate setting and scenery. The second of these concerts is scheduled for Wed., June 27 at 7 p.m.. Later in the week, two more performances will take place at the Sunnyside Adventist Church in Portland on Fri., June 29 at 7 p.m. and Sun., July 1 at 7 p.m., featuring guest performances by Oregon Symphony members Nancy Ives and Joel Belgique. Admission to each concert is free of charge, and all four are set to feature different musical works, so each performance will be a new experience. Part of the reason Dickson chose to bring this type of music to the Vancouver/Battle Ground area is because he recognized that classical music does not currently have much of a presence here. Having grown up in Clark County, Dickson is passionate about serving the community through his craft. “Being able to come back here and give back to the community and have them be involved is really kind of a dream come true for many musicians, so I consider myself very fortunate and very blessed to have a very supportive community,” Dickson says. In fact, much of Dickson’s early music education took place in Vancouver. One of his first piano teachers, Colleen Adent, is now performing alongside him in the concert series. Of course, as he grew older, Dickson began to work harder and and harder; now, after earning a double-major in piano and cello performance and a double-masters in piano and cello performance, Dickson is attending Boston University with the hopes of earning a Doctorate of Music degree. Adent, who will continue to perform in the concert series throughout the week, says that she has greatly enjoyed getting to know and perform with the many musicians recruited to the cause. “They’re just all fabulous players, and they work well together, and there’s a comradery. Coming together we don’t have very much time to rehearse, we just put it together quickly. That challenge is kind of fun,” Adent explains. In contrast, this endeavour has been anything but last minute for Dickson. Planning began for this year’s concert series immediately after the 2017 series ended. Organizing musicians, finding venues, fundraising, marketing, and hiring event staff makes for about eight months of work. Having poured his time and effort into the concert series, Dickson is hopeful that the audiences will find something valuable in the performances they see. More information on the 21st Century Artist Initiative and their 2018 concert series can be found online at www.21stcenturyartistinitiative.com .